Medium - $39.99 Large - $39.99 Only 7 left! You know, sometimes you've just got to honor the classics. However chic and in style it might be, a burgundy lip will never take the place of a classic red pout. When you're feeling homesick there's no combination that's more comforting than warm chocolate chip cookies and milk. You might have ten dresses in your closet but if none of them are little black dresses than you'll still have that moment when you feel like you've got nothing to wear. When it comes to breakfast, classic is king. Restaurants and diners are always trying to innovate but the best breakfast burrito in the world will never replace French toast. The success of French toast makes sense, its flavor and texture represents everything that's good about breakfast. French toast is delicious white bread, it's fried egg, and of course, maple syrup. To make things even better it pairs perfectly with bacon. Who could come up with something so refined, so elegant, so simple? No one but the French, that's who. The question is, how do we ever thank them for so many awesome breakfast experiences? That's easy. With this French toast costume you can let the French know how much you appreciate their culture: classic beret, classic black striped shirt, and of course their food. 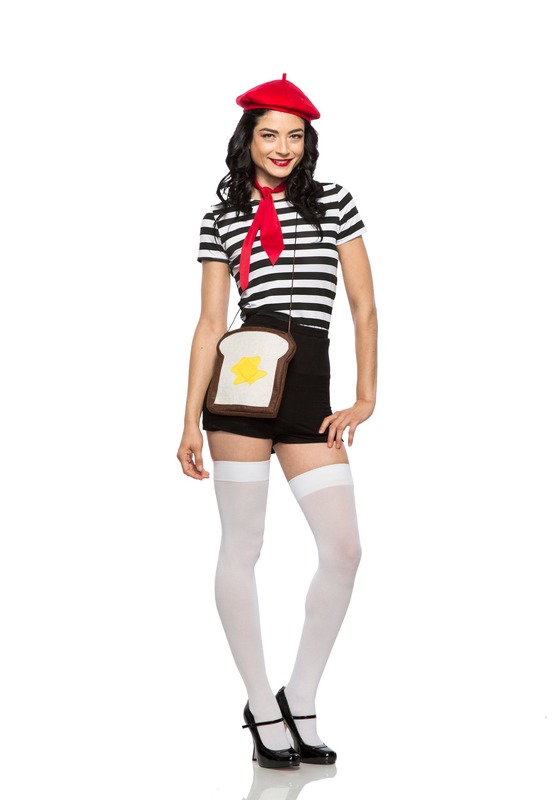 You'll look like you're straight out of a Parisian postcard is the high waisted shorts, striped boat neck shirt, and red tie and beret; and to get the point across you get a purse shaped like your favorite breakfast food. If anyone tells you that you're stereotyping the French simply roll your eyes and shake your beret no. You're not stereotyping, you're honoring a classic.